This page provides a list of free online tools that help you to reduce the time you spend searching and managing terminology. This is not intended to be an exhaustive list, but rather a place to organize and store potentially useful tools as I encounter and use them. Suggestions for additional tools to include on this page are welcome! New! 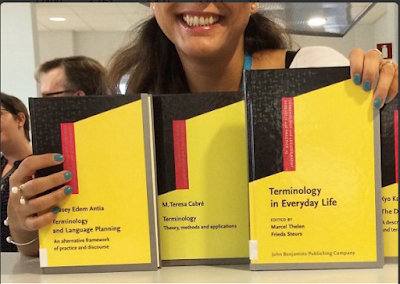 A form to check whether your glossary conforms to terminological methodology:TermTest by TermCat. 2lingual: a super useful dual-language search tool that makes it easy to Google Search in 2 separate languages. Dante: Database of Analysed Texts of English. Kamusi: The Global Online Living Dictionary. Every Word, Everywhere. Magic Search: Search multiple sources (dictionaries, corpora, machine translation engines, search engines) with a single click with this multilingual metasearch engine. Select a language pair and submit a search. MagicSearch will display a single scrollable page with multiple sources. Memidex: is a free online dictionary and thesaurus with a simple interface, complete inflections, auto-suggest, adult-filtering, frequent updates, a browsable index, support for mobile devices, and millions of external reference links for definitions, audio, and etymology. ProfessorWord: this lookup tool provides the definition of almost any word that you don't comprehend, and you don't even have to leave the page! It's your on-demand dictionary. Power Thesaurus: fast, convenient and comprehensive online thesaurus. It's crowdsourced, meaning it has been built by a community of writers for writers. The synonymic and other associations are suggested, rated and used by its visitors.The vast collection of quality terms in Power Thesaurus is original and is based upon regular visitors' participation and constant work of our editorial department for more than 10 years. Users enjoy easy-to-follow look & feel, yet with powerful assisting tools. The free service is supported by a few non-intrusive quality ads by premium advertisers. ProZ.com term searches: search translation glossaries and dictionaries. QwickUp: provides access to your favorite online lookup services (dictionary, etc.) in one place by one or two clicks of the mouse. TermWiki.com is an online terminology portal that allows users to search, upload, translate and share terms and definitions with other users around the globe. Peer edits and worldwide collaboration help foster a database of continuously growing and updated terminology, as well as term translations in over 100 languages. Vocabulary.com: The world’s fastest, smartest dictionary: start typing a word and you’ll see the definition. Wikipedia's sidebar: Wikipedia's sidebar links to the same article in other languages can be used as a multilingual terminology database. I know we cannot qualify this as a proper terminology database but it is concept-oriented. Wordnik: definitions from multiple sources, so you can see as many different takes on a word's meaning as possible. Wordfinder: subscription-based dictionary service. You can search your dictionaries online or offline. This means that you always have access to your dictionaries, regardless of if you are at home, at work or traveling. YourDictionary: YourDictionary is easy to use online dictionary and thesaurus. It offers quick-click access to more in-depth information including specialty definitions and related articles. It provides straightforward definitions that actually make sense along with example use cases for the most popular words. Visuwords - online graphical dictionary: Look up words to find their meanings and associations with other words and concepts. Produce diagrams reminiscent of a neural net. Learn how words associate. Visual Thesaurus: an interactive dictionary and thesaurus that allows you to discover the connections between words in a visually captivating display. With a subscription, you will also get access to the Spelling Bee, VocabGrabber, and Online Magazine. Global Glossary: multilingual dictionary built by combining a multitude of sources from all over the Web. Glossary Links: database contains 1400 different glossaries with a category, language, and keyword search (the keyword search looks only for words in the title of the glossary). Glossarissimo: Monolingual, multilingual resources and terminology. Lexicool.com:offers primarily a directory of "all" the online bilingual and multilingual dictionaries and glossaries freely available on the Internet. MetaGlossary: to find meaning, not just links. Defining over 2,000,000 terms, phrases, and acronyms. TermCoord Glossary Links: European Parliament Terminology Coordination. Mamma: The mother of all Search Engines. Metacrawler: search results from Google, Yahoo, Yandex. Soovle: A customizable engine that provides the suggestion services from all the major providers in one place. Term Wiki Toolbar: The TermWiki Toolbar is a free, powerful tool for quick term reference and translation. Installed in minutes, it is an invaluable tool for all of your terminology management and glossary development needs. Intelliwebsearch: is a free software utility. It allows you to query multiple online and local resources by selecting text and then hitting a combination of keys; the results are shown in your browser or local application. DictionaryBoss Toolbar: The DictionaryBoss toolbar offers convenient web search, homepage, and default search. Term-minator: The toolbar features an innovative search function that allows searching at the same time Google and many other websites. Type a term in the search box, press Enter and in the next screen, the general Google search is enhanced by a number of links to search the same term. Proz Toolbar: Toolbar access to KudoZ. Type a term into the KudoZ toolbar to instantly search KudoZ and other ProZ.com resources. EuroTermBank Add-In for Microsoft Word: accesses over 2 million terminology entries in 27 European languages. Terminotix Toolbar: a free toolbar which allows users to launch queries directly from MS Word.It provides access to 13 databases available at the click of a mouse, directly from MS Word. TermWiki Widget: allows global websites to easily embed TermWiki’s vast database of subject-specific terminology content on their own pages for free. AntConc: is a freeware concordancer program for Windows, Mac, and Linux. It was developed by Professor Laurence Anthony from the Center for English Language Education in Science and Engineering at Wasada University in Japan. Le Migou: an online unilingual (French) concordancer that allows a user to consult general and specialized language corpora which, for the most part, have been compiled by members of the OLST. Users must register, but access to Le Migou is free. TextSTAT:a multilingual concordancer for text analysis. It produces word-frequency lists and concordances while producing a corpus with the submitted texts. TextSTAT can be downloaded online for free. TradooIT: a bilingual concordancer offered by Logosoft that allows users to search for character strings in their context in a translation memory system or find terms in a term bank. The results are displayed in tables, highlighting occurrences in the source language and their equivalents in the target language. To narrow down the search results, TradooIT also presents the statistics of different forms and allows you to filter through the results by function, form, source, etc. TransSearch is a bilingual concordancer in which users can search in French, English or Spanish. It also displays the source term and its translation in context. Users receive a free five-day trial when they first register but must pay to access the tool afterward. WordSmtih Tools is a unilingual concordancer with a corpus analysis tool. It analyzes texts and corpora to extract statistical information on words found in the texts and can process several file types. This program is available online free of charge. Corpus BYU Corpora: created by Mark Davies, BYU. Corpus of Web-Based Global English: GloWbE (pronounced like "globe") is related to other large corpora that we have created, including the 450 million word Corpus of Contemporary American English (COCA) and the 400 million word Corpus of Historical American English (COHA). Lexical databases and corpora byJen Smith · UNC Chapel Hill: list of links to lexical databases and corpora, organized by language or language group. Ludwig Guru: linguistic search engine which helps you to find the perfect word or sentence from a corpus of reliable and trustworthy sources. Keyword Tool: Conceived as a SEO Keyword suggester, it proves to be very useful for looking up collocations. It provides the keywords that people are typing into Google search box. Monco: Corpus search engine based on a selection of English language news websites. Currently, the index of Monco grows by approximately 8 million words every day. OPUS: is a growing collection of translated texts from the web. OPUS is based on open source products and the corpus is also delivered as an open content package. Sketch Engine: is a Corpus Query System incorporating word sketches, one-page, automatic, corpus-derived summaries of a word's grammatical and collocational behaviour. WebCorp: WebCorp is a suite of tools which allows access to the World Wide Web as a corpus - a large collection of texts from which facts about the language can be extracted. BabelNet: a Wide-Coverage Multilingual Ontology. FAOTerm Portal is the Food and Agriculture Organization of the United Nations' terminology portal. The TERM PORTAL has been created to store, manage and update concepts, terms, and definitions related to the various fields of FAO’s activity. The idea is to offer a single search window for all glossaries, in one or several languages, as a mechanism to enhance the exchange of information and facilitate communication. IATE InterActive Terminology for Europe is the European Union's terminology database. It includes more than 8.7 million terms in the 23 official EU languages. The terms are submitted by translators from European institutions and then verified by the linguistics department's terminologists. It is available online free of charge. Le grand dictionnaire terminologique is a terminological dictionary created by the Office québécois de la langue française. It includes French, English and Latin terms from a variety of fields and is available online free of charge. It takes regionalisms and new spelling norms into account. ONTERM is a bilingual terminology database that provides information and terminology for the Government of Ontario. It has also had glossaries, style guides, and a database of official geographic names. TERMIUM Plus is the Government of Canada's terminology and linguistic data bank provided to the public free of charge. On top of term records made by the Translation Bureau's language professionals in French, English, and Spanish, it also includes 14 electronic resources for writing and translating. UNTerm is the United Nation's terminology database. It contains technical and specialized terminology in each of the six official UN languages (English, French, Spanish, Russian, Mandarin, and Arabic) as well as phrases frequently used by the Organization. WTOTERM is the terminology database created by the World Trade Organization (WTO). Searches can be carried out in and equivalences can be found in French, English, and Spanish. The terms included pertaining to the field of international trade. TERMDAT:is an extensive multilingual specialist dictionary, providing a versatile aid for communication, text composition, and translation. TAUS Data: a cloud platform based on shared translation memories. It has 2130 language pairs in the repository and 52.923.096.600 total number of words in the repository. MyMemory: the world's largest Translation Memory, 100% free. It has been created collecting TMs from the European Union, United Nations and aligning the best domain specific multilingual websites. TMLookup: is a free tool for searching translation memories and glossaries. It can handle large TMs and multilingual databases, containing millions of entries. TMLookup can be used even without a CAT tool. (Chemistry) Multilingual REACH and CLP terminology database ECHA-term: terminology of the Institute for Health and Consumer Protection – (JRC-IHCP), European Commission. (Internet) Webopedia: is a free online dictionary for words, phrases and abbreviations that are related to computer and Internet technology. Webopedia provides easy-to-understand definitions in plain language, avoiding the use of heavy jargon when possible so that the site is accessible to users with a wide range of computer knowledge. (Statistical, legal, technical, patent) WIPO Pearl: WIPO’s multilingual terminology portal gives access to scientific and technical terms derived from patent documents. Diatopix: a free tool that allows users to visualize the geographical use of words, terms or expressions graphically. It uses a series of Yahoo! Web searches and separates the results according to the main countries where the search language is spoken. Inspiration: a terminology software tool that allows you to create subject-field breakdowns. Users can benefit from a free 30-day trial. KwicKwic: a fast and easy-to-use tool for investigating text data. It was designed as a simple yet powerful search tool for Linguists, but can be used in many other fields as well. The standard search allows wildcards, multiple words, proximities, an option to combine queries, and if needed, full access to Regular Expressions. The results are presented in a sortable Key-Word-In-Context (KWIC) display for fast scanning of the data. Language Portal of Canada: has several free resources available. It distributes and promotes Canadian Language products and promotes Canadian competence in the language field. It also aims to ensure effective communication in both official languages. PerfectIT: helps to locate typos and errors in Microsoft Word documents. It finds mistakes that no spelling or grammar check will discover, which makes proofreading faster. It checks for consistent hyphenation and capitalization, abbreviation definitions, capitalization of headings, list/bullet capitalization and punctuation and international spelling variations. It can also find comments left accidentally in documents. TermoStat Web: is a term extractor that uses linguistic and statistical methods while taking the potential terms' structures and relative frequencies into account in the analysis corpus. TermoStat is free, but users must register. YouAlign: allows users to create bitexts from archived documents. YouAlign bitexts contain a document and its translation, aligned at the sentence level. YouAlign can generate TMX files for use with a translation memory and HTML files for web publication or use with a full-text search engine. @WordLo It's a very useful page, specially dealing with terrminology! @WordLo Grazie a te! La tua lista mi sarà molto utile!